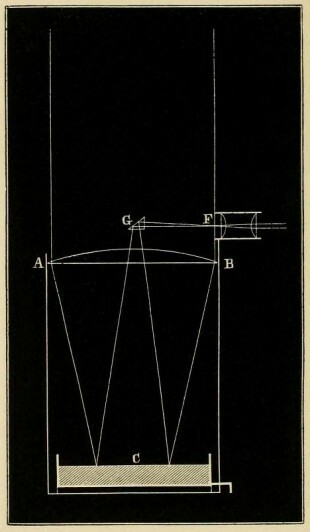 In the late 1840s while Airy was working up his proposals for the new Transit Circle, his thoughts had also turned to a replacement for the 25-foot Great Zenith Tube in Flamsteed House – a telescope that had proved unsatisfactory partly because of its location, and partly because of its design. Acquired solely for making observations of the star γ Draconis, the new instrument was designed around the Object Glass from the Troughton 10-foot Transit Instrument (which soon to be decommissioned). Known as Airy’s Reflex Zenith Tube, it worked using reflected images from a tray of mercury set below it. Persistently anomalous results which were presumed to be the result of undiscoverable sources of instrumental error lead to its abandonment in 1882. The problem however was not with the telescope, but the interpretation of the results. The apparent discrepancies were subsequently accounted for by the Chandler Wobble (also known as ‘variation of latitude‘) which was discovered about 10 years later. 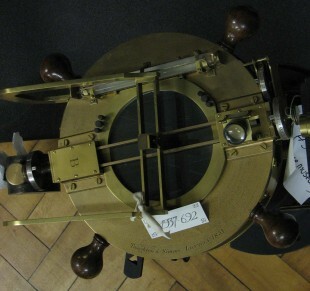 Following a paper by Chandler in 1901 (see below) in which he sang the praises of the Greenwich Reflex Zenith Tube, it was brought back into use in 1902, for variation of latitude observations until 1910, after which no further observations were made at Greenwich. 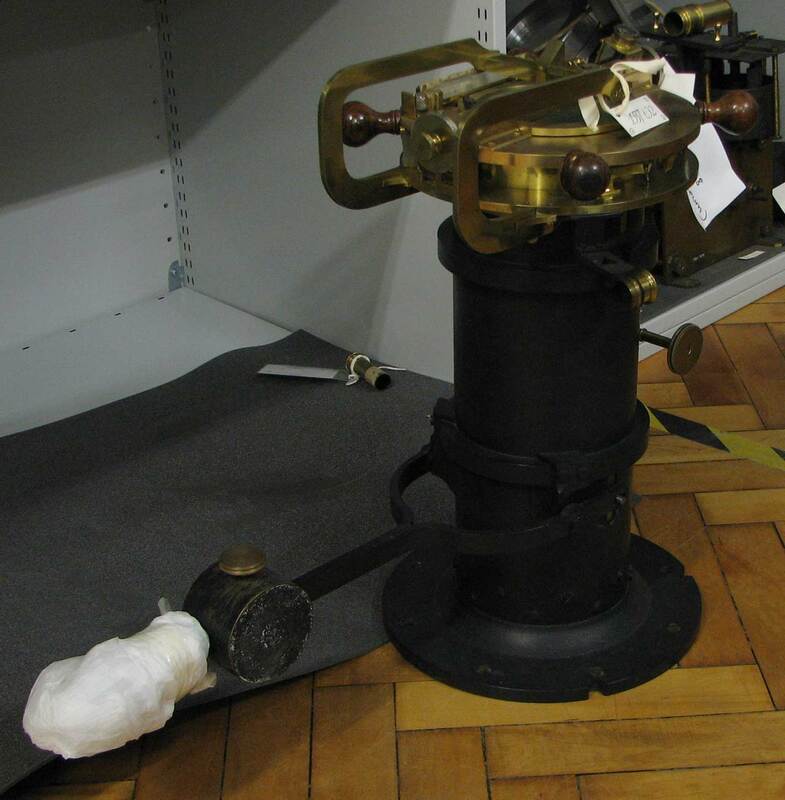 Superseded by Cookson’s Floating Zenith Telescope in August 1911, it was dismounted in April 1923 (when the room it was in was converted to a paper store) and placed in Case O of the lower Museum in the South Building. It appears to have subsequently been taken to Abinger to determine the latitude of the Magnetic Observatory and is recorded as being there in November 1929 (RGO39/4/5). Donated to the Science Museum in 1937 (Object No. 1937-692), it was loaned to the National Maritime Museum for exhibition purposes in 1967, where it was displayed in the Meridian Building until the 1980s. It is currently in store at the Science Museum. The following description is taken from Lockyer’s Stargazing Past and Present (London 1878). It should be read in conjunction with the sectional drawing (right) which shows the path of the rays of light. ‘A, B, is an object-glass, fixed horizontally, and below it is a trough of mercury, C, the surface of which is always of course horizontal. The light from a star near the zenith is allowed to fall through the object-glass, which converges the rays just so much that they come to a focus at F, after having been reflected from the surface of the mercury, and also by the diagonal mirror or prism, G; at F, therefore, we have an image of the star, which can be examined together with the cross- wires at the eyepiece, M. There is in this instrument no necessity for the accurate adjustments that there is in the case of the transit, the surface of the mercury being always horizontal, and so giving an unaltering datum plane. 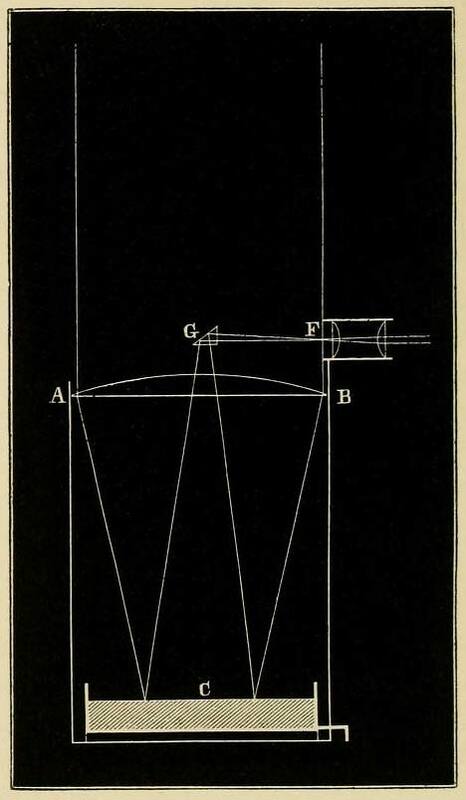 A full description of the telescope, its mode of use together with accompanying diagrams was published by Airy in Appendix 1 of Greenwich Observations 1854. In the introduction to the volume he gave the brief (but incomplete) description transcribed below. The clock in the Reflex Zenith Tube Apartment was marked ‘Mudge and Dutton’. It was presented to the Observatory in 1846 by the Rev. Charles Turnor. To house the new instrument Airy, settled on a cupboard sized room in the Meridian Building that jutted out from the north east corner of the then Circle Room (the soon to be Transit Circle Room). Although the room appears to have been built as a single story onto the existing buildings between 1813 and 1831, its origins and original purpose are obscure. The walls of the room were raised, and a flap shutter mounted on the roof. The floor on which the instrument was carried was raised about five feet above that of the Transit-Circle Room, and a pier carrying the mercury-trough built on a pyramidal stove-flue below it. It was the mercury that was to prove the locations undoing. Every time the adjacent courtyard gates were opened or shut, a jarring of the mercury would result. 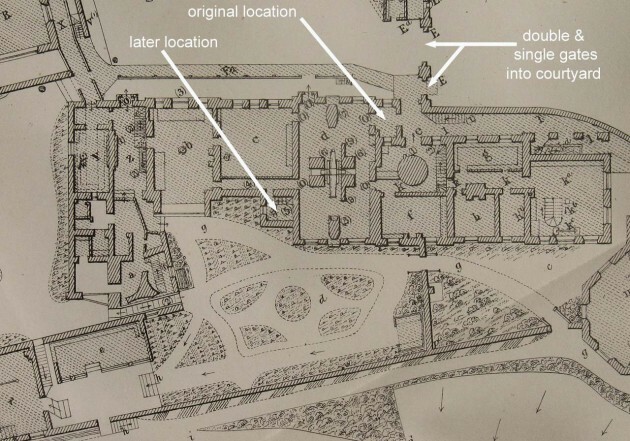 In 1853/4, Airy decided that a new room for the telescope should be constructed on the other side of the building in the recently created angle between the Transit Circle Room and the passageway behind his Official Room. Funding was not immediately forthcoming and it took until 1855 for the extension to be erected. As well as the telescope, the clock ‘Mudge and Dutton’ was also moved. In the new location, the mercury trough was supported on a box of dry sand resting on the ground. But the mercury suffered from an intolerably large and never ceasing tremor. A well was therefore dug below the telescope and a stage erected at its bottom to support the trough of mercury. When no diminution in the tremor was observed, the well was dug deeper and deeper, and the support stage for the mercury trough adjusted accordingly. Digging was eventually stopped when, with the problems still unresolved, the well had reached a depth of ten feet – some seven feet below the building’s foundations. It had by then been realised that the vibration problem was a result of the very structure of the hill itself, its compacted mix of sand and pebbles leading to the ready transmission of vibrations and tremors. The problem of transmitted vibrations does not appear to have affected the mercury troughs that began to be used with the Mural Circles in 1822, but did have serious implications for the Observatory in later years as the railways were extended and Greenwich Power Station was built nearby. The problem of the transmitted vibrations as they affected the Reflex Zenith Tube was mitigated by backfilling the well with ‘incoherent rubbish’ and suspending the mercury trough on a rather more complex arrangement of staging. This however was not the end of the problems with the design of the room. As originally built, the window (which was in the west wall), did not open. Those tasked with using the telescope were of the opinion that the star images would be rendered better if the ventilation in the room was improved. The window was accordingly altered in 1857/8. Given what is now know about the poisonous nature of mercury vapour, there was undoubtedly a beneficial effect on the health of the observers too! Regrettably, the two rooms that had housed the Reflex Zenith Tube were both demolished during the conversion of the building for museum purposes in the 1960s.